2 To make compote, place strawberries in microwave safe bowl. Sprinkle them with sugar and water. Cover with a ceramic plate or plastic wrap and cook on high for 2 minutes. 3 Remove from microwave and uncover with caution as it will be hot with steam. Stir mixture. If needed, cover again and heat for one more minute and then leave to cook in own steam for 5 to 10 more minutes. Cool before layering in trifle. 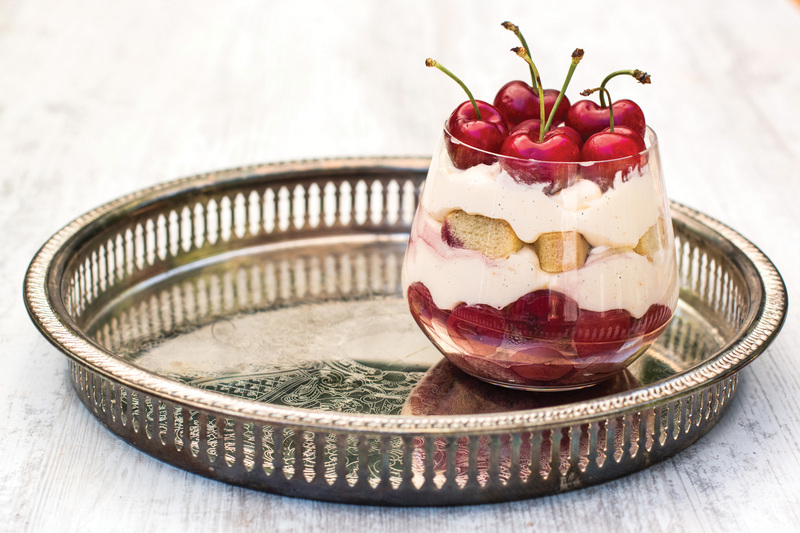 4 For trifle assembly, simply place half of the panettone pieces in individual glasses or one large serving bowl. Top with half the strawberry compote and half of the Vanilla Bean Double Cream. Repeat this process again, and then top with fresh cherries. 5 Cover and place in the refrigerator overnight to chill. Enjoy!